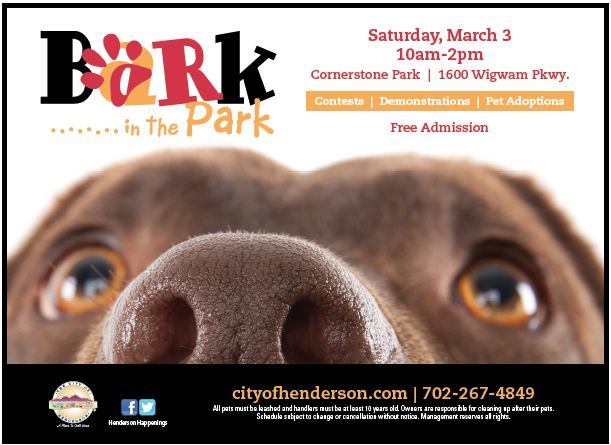 Bark In the Park features four hours of fun for you and your dog. Watch demonstrations and visit informational and vendor booths, take part in fun contests, and meet lots of beautiful dogs looking for forever homes. The Animal Foundation booth will feature a few adorable dogs available for adoption. All pets must be leashed and handlers must be at least 10 years old. Owners are responsible for cleaning up after their pets. Admission is free. The Rover Run 5K is at 9am just before Bark in the Park for those looking for a casual run or walk with their dogs. The first 350 participants receive a t-shirt for them and a collar for their dog! Check out the event page for details on how to sign up.